Want to take a stand against privatization of your public school? Here’s an organization that could help. Sign the letter to Devos! 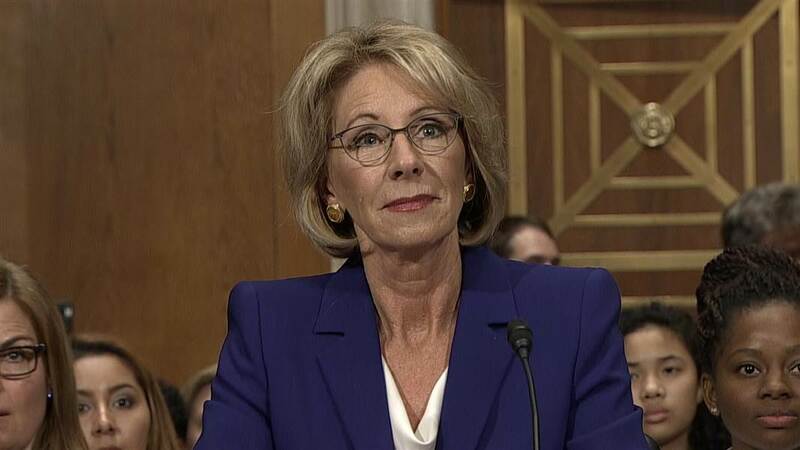 Sign the letter to Devos, our new federal education secretary, to ask for answers to the questions she did not answer during her confirmation hearings. A funny article that i could relate to as both parent and teacher! Winchester parents should note that teachers will start the year with most student supplies purchased from the school budget! So we started doing the school supply shopping this week. A daunting task even as the kids get older and the lists get shorter. Gone in my house are the days when the most expensive item on the list was the ever-elusive “just this size” binder. Now, we’re talking calculators that rival my electricity bill. But I sigh, watch the ads and get out there and do it. I put on my thickest armor because nothing will be just right for my kids. The kitty folders are too childish; the more mature ones are $200 apiece. Add to that the hysterical mobs crowding the $1 pencils like they were the last chance to win tickets to a 21 Pilots concert, and we have a joyfest that keeps on giving. (Insert sarcastic eye roll here). Yes, I’m frustrated. And let’s talk about that list; shall we? I mean, who in their right mind thinks it’s a good idea to request that our kids purchase Expo markers in bulk or boxes of Kleenex that should be supplied already? ESPECIALLY when those might not get used by my kids? Who thinks it should be my job to bring Ziploc bags to school? Well, I’ll tell you who. This mom. I’m not going to buy just the one extra box of tissues because (let’s all be honest here) I can afford more than that. And “gasp” what if someone other than my precious Timmy uses them? Well, then, haven’t I done a good deed for the year for less than the cost of a coffee? We should all be interested in what will create the best learning environment for all these kids, for all these little people who will be making big decisions some day like what to do with YOUR Social Security or how to fix YOUR city infrastructure or how best to treat that cancerous mass in YOUR body. If you don’t agree with something on the list and think it’s excessive, have a conversation with the teacher. I guarantee if it is something that will actually get used to educate your children, the teacher will be able to explain how. Yes, Expo markers are expensive. Get in a classroom and watch children solve problems at their desks (sometimes ON them) with them and really engage in the process because it all of a sudden became colorful and perhaps a little bit taboo. You think you have to buy too many glue sticks? I invite you to join a class when they do a simple sorting and gluing project that gives the kids one more opportunity to understand all the “-augh” words and their various pronunciations and watch multiple children go through half a stick just for that one project. More is more, right? And yes, the theory is that you teach them to use less, but let’s be honest: some just use what they use. Watch kids “clean” the floor at the end of the day and, in a rush to get home, throw away all the “trash” they found, which includes half used pencils and crayons that would take too long to find a home for. So, let’s fast forward to January. The supplies are no longer new and shiny, and more than a few have met their untimely trash can demise. Used and broken crayons look better in that circular file than in pencil boxes. Glue sticks that still have some in them but are not the easiest to use just aren’t worth it anymore. Markers find new homes in backpacks. Pencils that have no erasers have lost their appeal. Dry erase markers are dried up because they have been used to solve, spell, create. And then what happens? Supplies that were an extra $10 from you at the beginning of the year for one kid become extras in your kid’s teacher’s cart at Target during a grocery run. And forget the $10. Oh no. Multiply that sucker by – how many kids were in that classroom? Was it 20? 30? Let’s see. A version of this post originally appeared on butimeanwell.wordpress.com. Do you have a child in high school this year? High school is a time of growth and change for kids – and for their parents! The high school years go very quickly. A ninth grader walks in the front door, parents blink their eyes, and a senior is walking across the stage at graduation. Where did the time go? High school is the end of the process of preparing children for the real world. 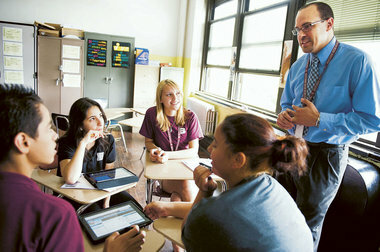 High school teachers practice tough love and hold their students accountable. They do not enjoy making life difficult for their students, but they expect them to be responsible for their own behavior and learning. The job of a high school teacher is to prepare students for college and careers, not to make the students happy. The job of a high school teacher is to help their students learn how to function independently. This is much easier and more effective when parents get on board! Parents will notice that they get less communication with teachers at the high school level. Feel free to call or email, but the teachers expect the students to take the lead in asking for help. The teachers will not fill parents in on every little thing that happens in school. To be successful in high school and college, students have to be self-motivated and in charge of their own learning. Parents cannot do it for them. Parents are close to their children and want the very best for them, so they often lack perspective and panic too soon. Teachers often have a much clearer picture of a student’s strengths and weaknesses as compared to others of the same age, and that can be very helpful to parents. Teachers, counselors, and school psychologists can help parents gain perspective and get a better understanding of their child’s gifts and challenges. One of the things that happens in high school is that the hopes and dreams of childhood meet reality, and that can be hard. The boy who always wanted to join the Air Force and fly airplanes might find that he doesn’t meet the vision requirements, or he doesn’t get accepted at the Air Force Academy. The girl who always wanted to be a doctor might fail Biology or struggle with Chemistry or faint at the sight of blood in the Health Occupations class. Again, we don’t always get what we want, and high school is usually the time when the rubber meets the road and students have to accept their strengths and limitations. Stay involved and stay informed, but let your teenager take the lead in managing his school life and school work. Self-direction is an important life skill! Support and attend school events. It’s still important to be part of the school community. Volunteer when you find a good opportunity. In high school, these opportunities often involve chaperoning students on a trip, mentoring students, fund-raising, or helping out at sporting events. Know the classes your child is taking and meet the teachers. Check in with teachers if necessary, but don’t take over responsibilities that belong to your student. Be honest, and help your teenager celebrate gifts and accept challenges. It’s time to accept reality and build on strengths. Nobody can “be whatever you want to be” – that’s just not true and to say it is telling a lie. Require your child to respect school rules – including dress codes, regulations for cell phone use, and athletic eligibility requirements. Intervene immediately if your teenager gets off track with delinquent behavior, substance abuse problems, or truancy. Support school rules and accept school discipline procedures. Ask for help from counselors, school psychologists, school resource officers, school social workers, or school nurses. This is your best chance to get your son or daughter back on the road to success. Don’t wait! High school is your last chance to let your children try out their wings while you’re still there to help pick up the pieces if they fall. Let them try things on their own, make mistakes, and figure out their own solutions. Don’t jump in to make things perfect and to protect them from their mistakes. Independence is learned, and high school is the time to learn it. It’s time to start letting your children go! Your child spends more time at school than anywhere else except home. Make sure your school-aged children are ready for a healthy school year before and while they attend. Whether you’re a parent or educator, use these resources and tips to prepare for and work through common challenges, such as getting vaccinated, getting enough sleep and exercise, and eating healthy lunches and snacks. Most schools require that your child’s immunization shots be up-to-date. Remember, that each state has different immunization requirements. Let your healthcare provider know if you have any questions or concerns about the vaccines your child is scheduled to receive. School entry may require documentation of immunization records. Find out what your child’s school requires and bring any school forms for your healthcare provider to fill out and sign. Be sure to keep your own copy of any records. Failure to keep immunizations up-to-date could prevent your child from attending school. To prevent the spread of disease, it is more important than ever to vaccinate your child. In the United States, vaccines have reduced or eliminated many infectious diseases that once routinely killed or harmed many infants, children, and adults. However, the viruses and bacteria that cause vaccine-preventable disease and death still exist and can be passed on to people who are not protected by vaccines. Some diseases (like polio and diphtheria) are becoming very rare in the United States. Of course, they are becoming rare largely because we have been vaccinating against them. Unless we can completely eliminate the disease, it is important to keep immunizing. Even if there are only a few cases of disease today, if we take away the protection given by vaccination, more and more people will be infected and will spread disease to others. We don’t vaccinate just to protect our children. We also vaccinate to protect our grandchildren and their grandchildren. With one disease, smallpox, we eradicated the disease. Our children don’t have to get smallpox shots any more because the disease no longer exists. If we keep vaccinating now, parents in the future may be able to trust that diseases like polio and meningitis won’t infect, cripple, or kill children. Which Vaccines Do Kids Need, and When? Tdap: A booster to protect against tetanus, diphtheria, and pertussis (whooping cough). Recommended for preteens (11-12), as well as any teens (13-18) who haven’t gotten this shot yet. Meningococcal conjugate vaccine (MCV4): Protects against meningococcal disease. First dose is recommended at age 11 or 12 followed by a booster (2nd shot) at age 16-18. Human papillomavirus (HPV) vaccine: Protects against the types of HPV that cause most cervical cancers. HPV vaccine is given in three doses over a 6-month period to boys and girls starting at 11-12 years old. Influenza (flu) vaccine: Protects against different strains of seasonal influenza. A yearly dose is recommended for everyone 6 months and older. Also, check to confirm that your teen has received all recommended childhood vaccines, or if they need to catch up on any vaccines they have not yet received. Information on transitioning your kids from the site parenttoolkit.com. The middle school years are a roller coaster ride for everyone – kids and parents. The butterfly starts to fight its way out of the cocoon, and sometimes the cocoon has a hard time letting that happen! But parenting is full of passages and changes, and the middle school years represent one of those times – perhaps one of the most important. The differences between a sixth grader and an eighth grader – physically, emotionally, cognitively, socially – are immense. Most kids come to middle school as children and leave as adolescents. They go through puberty, they grow and develop, and the teenager parents see at eighth grade graduation doesn’t have a lot in common with the child they sent to sixth grade. In middle school, the students begin to take responsibility for their actions and their choices, and it is the parents’ job to let their child be accountable and take the consequences, good or bad. There will never be a better or a safer time to learn responsibility, independence, and respect for others. Middle school teachers provide a bridge between the nurturing teachers in elementary school and the content-oriented teachers in high school. They appreciate parents who are involved with their children, communicate with teachers, and take part in the school community, but they worry about parents who “hover”. Helicopter parents do everything for their children and try to keep them from ever experiencing a negative consequence or a negative emotion. The hard truth is that parents have to let their children fail so they can learn how to be successful. Parents have to let their children take the consequences for tardies, missing homework, and misbehavior. They still need to talk with teachers and ask questions, but middle schoolers need lots of room to experience the consequences of their decisions. Discipline is different at middle school. Teachers and administrators expect students to know the rules and routines of school, and to have the skills to follow those rules and routines. If a child does not have those skills, now is the last chance to do something about it. Parents can talk with the school psychologist or the school counselor to get some ideas and some guidance. Home/school communication is also different in middle school. Teachers expect students to be fairly independent and responsible, and they don’t hover. They have lots of students to instruct, and they don’t have the time to be anybody’s parent. Supervision is different in middle school. Students are expected to get off the bus or out of the car and come into school on their own in the morning. They are expected to handle their own materials and their own business. The supervision is there, of course, but it’s much more hands-off. If something happens at school that raises questions and concerns at home, the most effective thing to do is to set up a parent/teacher conference to discuss the problem. Schedule the conference in advance, let the teacher know the reason for the meeting, and bring a family member or friend along for support. Parents should be prepared to work towards a positive solution to the problem. In many cases, it is appropriate to have the student attend the conference as well. Students at this level are responsible for their own behavior and their own learning. Experienced teachers will tell you that seventh grade is a pivotal grade for students – particularly boys. This is a time when students either stay engaged and interested in school, or when educators lose them forever. Parents who stay engaged and interested in school have a much better chance of making that happen for their kids as well. The middle school years are probably the most difficult ones for everyone – students, parents, and teachers. So many physical and social changes are going on, and emotions are high. It’s a time when parents and teachers really need to communicate and work as a team, because it’s a time when kids choose their path – for better or for worse. It takes a village! School is starting soon! Are your children ready to learn? Children who are ready to learn are well-rested, fed, and dressed appropriately. They arrive at school on time, with completed homework in their backpacks. The easiest way to make sure that your children are ready to learn, every day, is to establish strong routines at home. A morning routine, evening routine, and homework routine are powerful ways to support your children’s education at school. We have discussed the morning and evening routines. So let’s get right into solving the homework problem with a strong homework routine! Most families have to establish a strong homework routine and incentive system to make the evening go smoothly. Some children can get homework done pretty much independently, and it isn’t an issue. Others, though, drag their families through three and four hours of crying and screaming every night. Life is too short for that! Set up a routine for where and when homework will be done. Choose a place and set up a homework center with supplies and a calendar for due dates. Remember that some children do best in a quiet spot away from the family, but others need to be near Mom or Dad for help and supervision. Do homework at the same time every day. Some children do best if they get it finished up as soon as they get home from school, but others need to play or relax first. Help your children set a homework schedule every day. Sit down with them for a minute or two and review their assignments, make sure they have all the necessary materials, set time limits for each assignment, and decide in what order the assignments will be completed. Set up a system of rewards for homework completion. Some children do fine if they just have something good to look forward to when homework is finished, like a favorite TV show. Others need something a little fancier, like earning points towards a bigger reward. Write a homework contract that states expectations and rewards. Different children need different homework routines. Children need to be part of the discussion and planning for their own homework routine because you are teaching them to be responsible for their own learning. The big decisions are: Where will homework be done, when will homework be done, what are the rewards for completing homework appropriately, and what are the consequences for failing to complete homework appropriately. It’s your job as a parent to provide the setting and structure your children need to complete homework. It’s also important to provide the supplies and organizational tools your children need. Supplies include paper, pencils, markers, ruler, calculator, and glue stick. A timer helps many kids keep on track. The most important organizational tool is a calendar. At the beginning of the year, write down school holidays and the dates report cards come out. As the year progresses, keep track of field trips, picture day, conferences, science fair, SAT dates, and due dates for assignments – especially long-term ones. 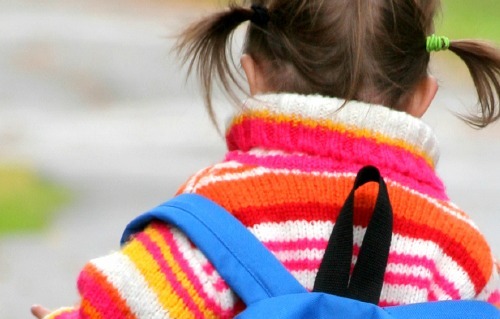 Some children are motivated and rewarded by grades. Others need external rewards and consequences. Adults like to talk about what “should” motivate kids, but the truth is that grades aren’t important to everyone. Start where your child is when it comes to rewards and consequences! Some children are motivated to do homework by the promise of TV or computer time after it’s finished. Others need the opportunity to earn points towards a bigger reward. Some children need immediate rewards. Others like to work toward a bigger weekly reward. If you have a child who is struggling with homework, pick just one of these steps to get started. Look online for the homework policy for your local school, or touch base with the teacher. Set up a homework center, or get a calendar and write down assignments. Just get started, and add steps as you can. In the end, you’ll have a solution to the homework problem. Strong routines at home are a powerful way for us to support our children at school. Pick the routine that will serve your family best and start working on it, one baby step at a time! Time to think about back to school! 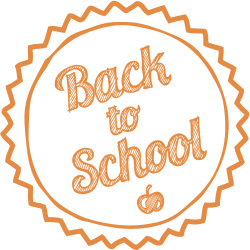 It’s the beginning of August, and teacher’s are thinking about back to school. The school itself is getting shined up for the students’ return. Teachers are starting to collect the supplies and materials they will need for the units that start the year. We start to think about how we want to lay out our rooms and what the bulletin boards will look like. We design seating plans, using the information we have received from the teachers your child had last year. We open our electronic plan book, and start entering our unit objectives and assessments, as well as the detail of the daily lessons. It is exciting for us to get ready for the new school year! Here is a link to an article on how to make your student more successful this year. As the 2014-2015 school year draws to a close, the members of the WTA would like to extend their gratitude to the Winchester community for its support this year. Each June we look back at the school year behind us and reflect on the steps we took in the past ten months, both in the classroom and out. This year, in addition to the opportunity to educate, support, and nurture our students, the teachers and staff of the Winchester School District had the chance to work closely with the community to garner support for our collective bargaining agreements. The WTA is very grateful for the support of the voters who put education first and came out this year to stand up for the students in the Winchester School District. We are looking forward to growing this connection between the school and the town in the coming months and are excited to work with you again next year. Thank you for your dedication to the children of Winchester.